If you know your bit of technology history, you'd know that Apple was actually working on an iPad before it developed the iPhone. What did those iPad prototypes look like? 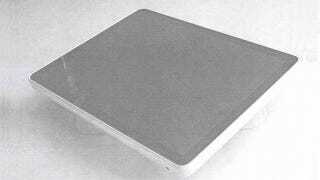 Well, according to these earliest known photos of an iPad prototype from the early 2000's, it looked really, really fat. My recollection of first seeing it is very hazy, but it was, I'm guessing, sometime between 2002 and 2004, some but it was I remember seeing this and perhaps models similar to this when we were first exploring tablet designs that ultimately became the iPad. So Apple had been working on the iPad for almost a decade, starting in 2002 and then finally delivering it in 2010 with the original iPad. It was worth the wait, if only so it didn't feel like we were working out our biceps every time we picked up this fatty prototype.